UniMeasure LX Series transducers are a low-cost compact device for use in light to moderate duty applications in dry environments. The plastic bodied device is ideal for high-volume OEM situations where cost is a major consideration and in applications where small size or low weight are of paramount importance. 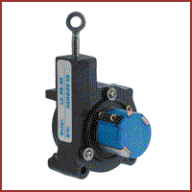 Models are available in 11 measurement ranges from 0"-2" (50mm) to 0"-50" (1250mm). Electrical outputs include both analog and digital.